Happy Monday! With Speaker Paul Ryan pulling the Obamacare repeal bill on Friday, my interview with this registered public health nurse was timely, as she explains so much! With Speaker Paul Ryan pulling the Obamacare repeal bill on Friday, my interview with this registered public health nurse was timely, as she explains so much! Twila Brase is a certified public health nurse and the cofounder and president of the Citizens' Council for Health Freedom (CCHF) in St. Paul, Minnesota. Her "wedge of health freedom," and more. By late last week, the Republican leadership had stopped arguing policy and started using brute force and tactics that alienate those wanting to argue policy. Last week: Trevor Loudon on who is behind the Trump resistance. Please ask a couple of your friends to sign up here for this weekly email alert about my video interview of the week! P.S. BOOM: Judge Jeanine Pirro has an eye-popping reaction to the health care bill going down last week. Watch this six-minute video here. Another valuable piece is here. Repealing Obamacare would be a disaster for women's health care. Call your representative and urge them to oppose this disastrous legislation. Fired up and ready to do more? 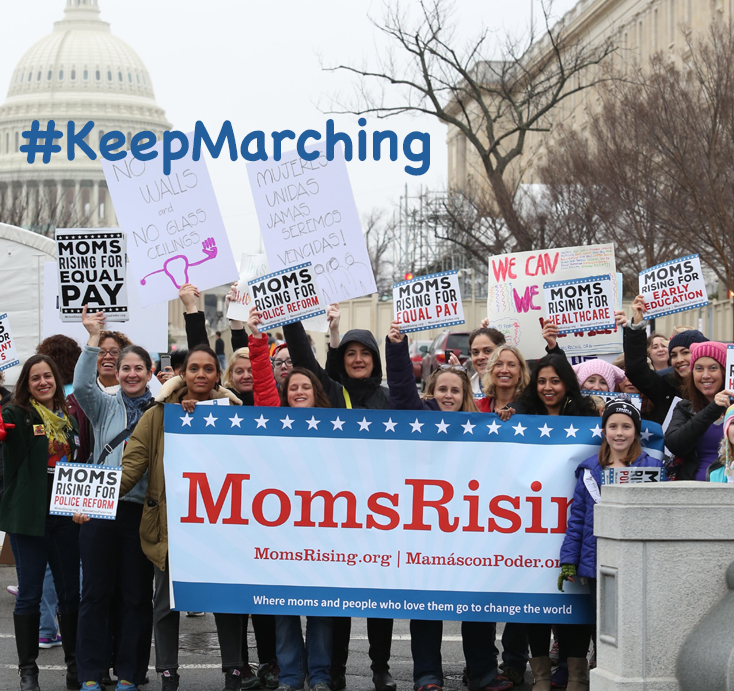 Become a MomsRising #KeepMarching Circle Leader! Help lead the fight against Donald Trump's destructive agenda! I'm a mom on fire. Every morning I wake up to the horror show in Washington, DC, and burn with renewed commitment to raise my voice, organize my community, build our movement, and do whatever it takes to fight for the future of our children. I am not alone. Tens of thousands of MomsRising members across the country are just like me, who share my passionate determination. But working for MomsRising, I have an important advantage: I have access to experienced colleagues, policy experts, and other resources to support my fight. In truth, these advantages and resources are available to you too! The rest of the MomsRising team and I agree: We are all here to help MomsRising members who are on fire, and want to share our resources with you! Here at MomsRising, we've been blown away by the groundswell of grassroots activism happening right now sparked by the Women's March. Millions of women participated...Make no mistake, the passion and commitment of women and mothers, who make the vast majority of healthcare, consumer and education decisions in our nation, are driving this new public engagement as they watch in horror the decisions being made by the President and his allies in Congress. We’ve been hearing from MomsRising members and volunteers across the nation who want to do more! So if you’re fired up in defense of families, communities and our country, and are ready to gather your family, friends and neighbors to stand strong against hate & for policies that lift us all, then we want to share the resources we have at MomsRising with you! #KeepMarching Circles give form and function to what you are looking to do or may even be doing already: Meeting with others to talk about current events, strategize about and what can be done to lift our communities and country; sharing your anger and emailing around to each other petitions and actions to sign; gathering for postcard parties and attending town hall meetings together; swapping meeting agendas, actions, and more. There’s a lot to do, and it’s often the most fun and easiest to do it with a group of people as well as an organization that shares your values supporting you. MomsRising wants to be that organization. When you sign up to be a #KeepMarching Circle Leader, you will be added to a secret Facebook group, where you can share information and compare notes with other #KeepMarching Leaders across the country. If you're looking for actions, you will be among the first to know about MomsRising's activities across all our campaigns and how you can help. We’ll also post sample agendas and action toolkits for you to use. Finally, we really are sharing MomsRising's resources with you! You will have more direct and immediate access to MomsRising staff, who will also be members of this Facebook group. Starting a #KeepMarching Circle is a fun and effective way to make a difference, and MomsRising makes it super easy for you. Marni said: "One of the best and most helpful calls I've been on, and I've been on A LOT of them lately. Love the idea about the legislative processes for the next call. Thank you for all you are doing!" The entire conversation was recorded, so at your first meetup, your group can listen to the recording, while following along with the downloadable toolkit, #KeepMarching: MomsRising Advocacy and Organizing Tactics and Tips. Afterwards, your group can decide your focus, develop a message, and begin discussing how you can work together to maximize your impact. And if you need help pulling it together, MomsRising staff is there for you! We give you access to the recording and toolkit right away after you sign up to be a MomsRising #KeepMarching Circle leader. Sign up now. It is our pleasure and honor to be on this journey with you – together, we are powerful! Like what we're doing? Donate: We're a bootstrap, low-overhead, mom-run organization. Your donations make the work of MomsRising.org possible--and we deeply appreciate your support. Every little bit counts. Donate today on our secure website.